Veteran CB Drayton Florence, who was released by the Bills on Friday, has been in the league long enough to know that first and foremost it’s a business. Florence tweeted the following after he was let go by Buffalo. Bills CB Drayton Florence is going to be watching Super Bowl XLVI on Sunday with the troops. Florence will be in Honduras with US troops stationed there. He talked about it on ESPN Radio. The interview starts at the 10 minute mark. Bills CB Drayton Florence is headed overseas to visit US troops. Florence will be visiting troops as part of an Armed Forces Entertainment tour in Greenland, Honduras and El Salvador. Florence, who has a sister in the service and whose father was in the service, plans to blog about his experience which is expected to last about one week. Stay tuned to the Drayton Florence Foundation website to hear more in Florence’s own words. With Buffalo’s current losing streak stretching further and further it’s drawing more and more comparisons to the club’s 0-8 start last year. Veteran Drayton Florence was asked after Sunday’s game if this slide is worse than last year’s. “I think it’s more disappointing,” Florence said. “We start off good 5-2 and we just hit this skid in the road and we haven’t been able to bounce back. The good teams bounce back from this. They may lose three in a row, but they bounce back and find a way to win. We just haven’t been able to find a way to win. The Bills are still mired in a lengthy losing streak, and veteran cornerback Drayton Florence believes if they don’t get a win in these final two games some heads could roll. Another loss this coming weekend would match Buffalo’s eight-game losing streak to start the 2010 season. On Saturday (Dec 17), 29 WNY children, all of whom have a parent serving overseas that they will separated from this holiday season, will be treated to a very special Christmas celebration courtesy of Drayton Florence, cornerback for the NFL’s Buffalo Bills, and the Drayton Florence Foundation. From 12-1:30 pm, Florence and some of his Bills teammates will be at the Santa’s Vision event, hosted by the Adam’s Mark Hotel in downtown Buffalo, and will host a private holiday party for these very special youngsters including a luncheon courtesy of Buffalo Wild Wings in Hamburg, a unique Christmas tree storybook time, distribution of gifts and all-around holiday cheer. Outside of the private event hosted by the foundation, the entire Santa’s Vision event is open to the general public from 9 am – 3 pm on Dec 17th and is entirely FREE! All kids in attendance will get a free toy in addition to enjoying free pony rides, face painting, and pictures with Santa. In addition, a special area will be set up for children to write letters to our troops overseas and meet some of the men and women who serve our country. On Tuesday, Nov.29, Drayton Florence and his Drayton Florence Foundation will host Trivia Time, a trivia contest designed to raise awareness and funds for children of local Buffalo military families who have a parent(s) actively serving our country and defending our freedom this holiday season. From 7–10 pm, fans can come to Buffalo Wild Wings in Hamburg, NY and test their trivia knowledge with Florence himself as the host. Prizes include a personal meet & greet with the cornerback, autographed items and more. DJ Trivia will handle the trivia contest itself. The event serves to raise awareness and money to create a Christmas to remember for the very special Buffalo area military families who are without their loved one(s) this holiday season. For an entry fee of just a $20 gift card to Walmart or a $20 donation to the Drayton Florence Foundation, fans can get in on the action, test their knowledge, challenge their friends and enjoy food specials courtesy or Buffalo Wild Wings. For more information go to Drayton’s website. NFL quarterbacks that have faced the Bills through the first nine games of the season have thrown a lot of interceptions, but they’ve also completed a high percentage of passes. Here’s a look as to just how much success opposing QBs have had against Buffalo. Opposing quarterbacks have completed 65.7% of their passes against the Bills. That’s the second-highest percentage in the league. Only Indianapolis has allowed a higher percentage (70.9%). The last two weeks Mark Sanchez and Tony Romo combined for a completion percentage of 79.6% (43-54). Buffalo has also allowed the second-most first downs this season via the pass (125), and are tied for the highest first down percentage allowed passing (40.5%) with Indy. A lot of Bills fans believe it’s the pass rush, which ranks 27th with 15 sacks this year, but if you ask the players it’s everything. Knowing the Bills are going to be wearing their white jerseys on Sunday against the Jets, they’re hoping the fans follow suit at the Ralph this weekend. Drayton Florence is the latest Bill to put out the call to Bills Nation. A play for prime time? Bills CB Drayton Florence was asked about getting off to a better start in games, which hasn’t been the case the past two weeks on both sides of the ball. Florence had a good tongue-in-cheek answer as to why they’ve had a couple of heart-pumping comeback victories the past two weeks. “We’re just trying to get ourselves some Monday night games so we’re keeping the games exciting and keeping them close,” Florence deadpanned. On a more serious note, Florence recognizes that the Bills can’t keep cheating the hangman every week. 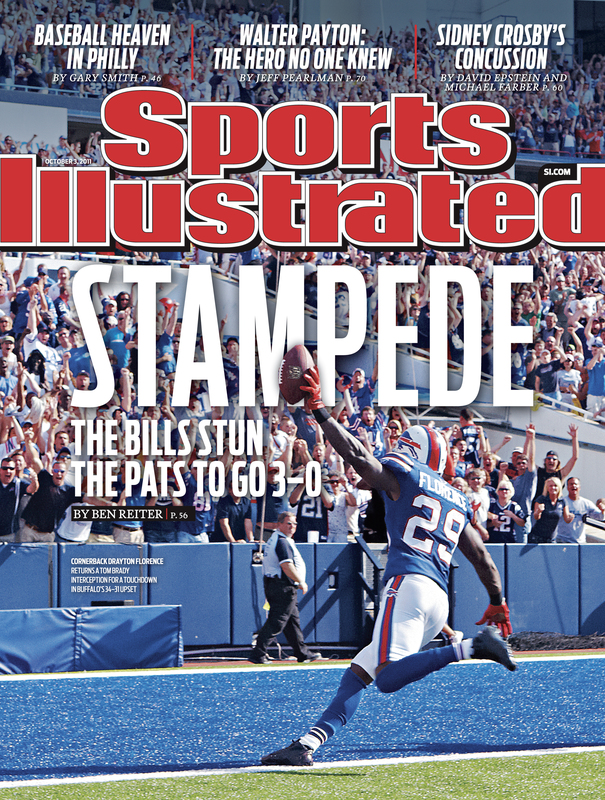 The Bills are the regional cover feature on Sports Illustrated this week after their win over New England. The cover shot features Drayton Florence’s interception return that broke the 24-24 tie in the fourth quarter. For those that aren’t in Western New York or New England you won’t be able to see it on newsstands, so here it is along with Florence’s thoughts about appearing on the SI cover. The Drayton Florence Foundation has announced a raffle for a game day experience package with proceeds going to help military families in the Buffalo area. The raffle is being conducted online at http://www.gamedayraffle29.com and kicks off today, the 10th anniversary of the September 11th tragedy. For just $10, you and a guest are entered into a drawing for a chance to watch the Buffalo Bills game on October 9, 2011 against the Philadelphia Eagles in style! The winner will be selected on Friday, September 30th and only 1,000 tickets will be sold. 2011 marks the second year that the Drayton Florence Foundation has partnered with the Wounded Warrior Project to provide Buffalo Bills tickets to our troops wounded while serving our country. Later this year, the foundation will host a holiday party for our western New York military families, complete with gifts, games and activities for the entire family. A child of a military family himself, with both his father and currently his sister serving our country, Bills cornerback Drayton Florence is all too aware of the challenges that families face during these deployments. It is because of this passion for our local heroes that Drayton has refocused the mission of his foundation to educate, motivate and stimulate youth, preparing them for a lifetime of success, to specifically serve the families of our active military. Bills head coach Chan Gailey said a few days ago that some players might play a little less than the rest of their teammates on the first or second unit depending on their situation. A couple of Bills vets will fall into that category for the preseason opener tonight. Buffalobills.com has learned that Shawne Merriman and Drayton Florence will get a bit less playing time than the rest of the starting defense against the Bears. Gailey had hinted earlier in the week that Merriman’s workload would be a bit less since his layoff from live football was longer than most. Merriman is expected to get about 10 plays. Drayton Florence, who returned on Wednesday from an ankle injury sooner than expected, will also be given a lighter workload so as not to overdo it and risk re-aggravating the injury. The rest of the starting unit is expected to get 15 plays, so the difference won’t be dramatic. For the first time since his first practice of camp LB Kelvin Sheppard is back practicing. And he’s joined by a host of other Bills backed from injury. Drayton Florence (ankle), Roscoe Parrish, Chris Kelsay and Donald Jones (calf) have all returned to the fold here at night practice. Flo to miss 1st preseason game? Bills CB Drayton Florence had more than just a cramp in last night’s practice, and now there’s a good chance that the veteran corner misses the first preseason game. Head coach Chan Gailey provided an update on just what Florence is dealing with. When asked if he figured that Florence would miss the preseason opener Gailey answered in the affirmative. It happened during 11-on-11 team work. It appeared that Drayton Florence made a successful break on the ball and Terrence McGee was also in the vicinity for the defense, but then the unusual unfolded. Right into the waiting hands of Lee Evans, who promptly turned up field and scored a would be touchdown. Easily the craziest play of camp so far. Drayton Florence is another veteran player that finally gets the green light tonight for practice with the league year officially starting at 4 pm. The veteran cornerback is glad to be back on the field and with the Bills. Florence figures to line up in his familiar starting right cornerback role, but having missed four days of work, we’ll see if he’s eased into things knowing it’s a full pads workout tonight. I’m ready to get out there and battle with the guys that I’m going to be playing with the whole season. It’ll be an interesting night practice today with the new signees able to participate for the first time in training camp provided 50% plus one of the players ratify the CBA with the final details being agreed upon between the league and NFLPA. A majority is expected to vote in favor of the new CBA by 4 pm, which would allow Nick Barnett, Brad Smith and Tyler Thigpen to all be on the field tonight along with Drayton Florence who re-signed with Buffalo. Head coach Chan Gailey is looking forward to it. Restricted free agent TE Scott Chandler will also be participating for the first time along with long snapper Garrison Sanborn, who re-signed as an exclusive rights free agent. Bills players with new contracts signed after the lockout cannot practice until the new CBA is ratified by the NFLPA. As Bills GM Buddy Nix said however, those players can work out on their own, and that’s just what Drayton Florence is doing. DraytonFlorence Just finished great workout at midtown athletic club top notch facility. Coming back for tomm for yoga class. Florence is just one of the players that can’t practice right now along with TE Scott Chandler, LS Garrison Sanborn, QB Tyler Thigpen, QB Brad Smith and recent signee LB Nick Barnett. I’ve got to believe all of them are staying on point working out on their own so they’re as ready as possible when they can rejoin their teammates on the practice field.